Lately, acai bowls have supplanted kale chips as the health food world’s biggest nutritional darling. So what’s an acai bowl? It’s kind of like an acia berry smoothie topped with fruit, nuts, muesli, and seeds. 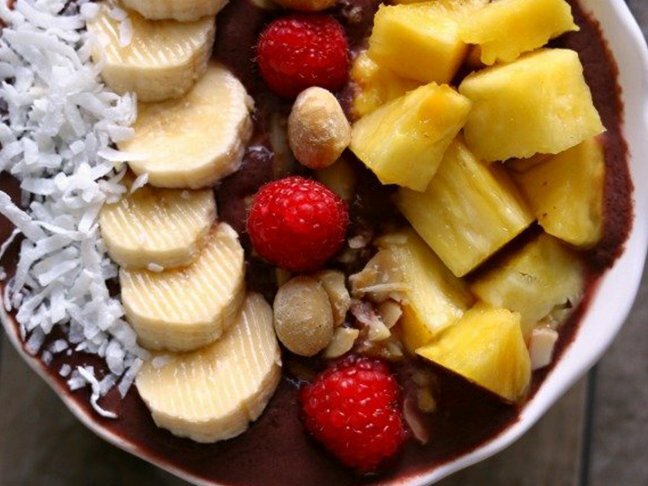 Acai bowls can be enjoyed for breakfast or as a healthy snack, yet they’re sweet enough to also be considered dessert. 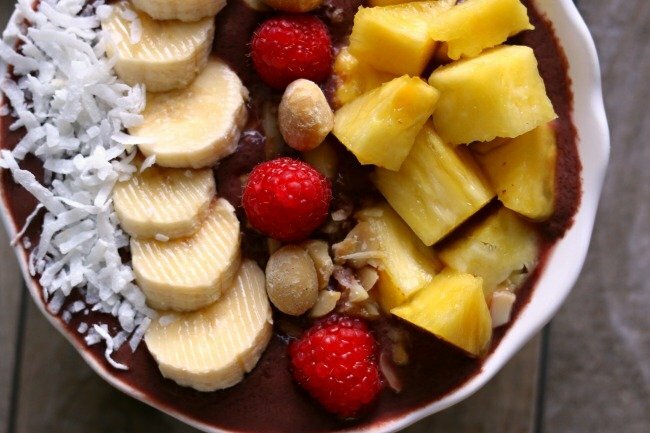 Best of all, these smoothie bowls not only taste delicious, but they also pack a potent nutrient punch, thanks to acai, which are tiny purple berries that grow in the rainforests of the Amazon. They contain antioxidants, which have anti-aging properties, as well as healthy fats to keep you energized and fibre to fill you up. Plus, they’re low in sugar, so they don’t spike your blood sugar like many other fruits do. You can buy frozen acai berry packs at the supermarket. I found mine next to the frozen fruit section. They’re a little pricey, but totally worth the health benefits—not to mention, when you make an acai bowl at home, you’re still spending much less than you would a cafe. 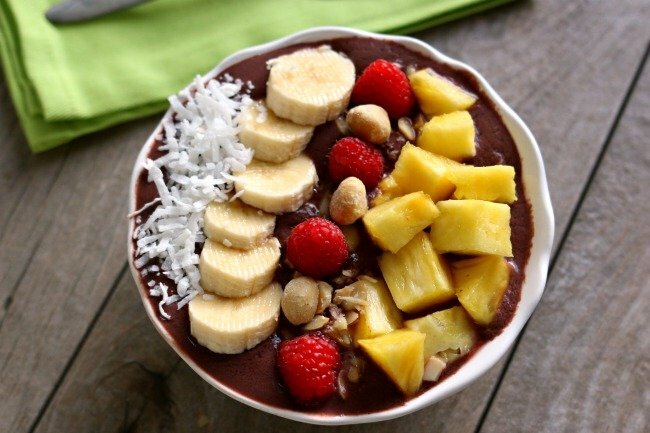 I decided to put a tropical spin on my acai bowl recipe. I wanted to capture the flavors of a pina colada, so I opted to add fresh pineapple and coconut. I tossed in macadamia nuts, bananas, and a few raspberries for colour. The fun thing about acai bowls is that they can be customized to your exact taste (and diet) preferences. Don’t want to spend $10 on an acai bowl at a restaurant or cafe? 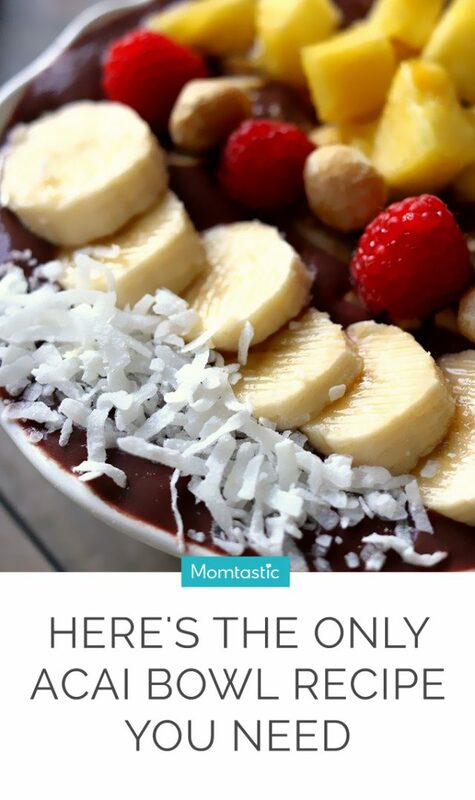 Here’s an easy acai bowl recipe to make yourself. Step 1: Add 1/4 cup of liquid to your blender. This liquid can be dairy milk, almond milk, juice, or coconut water. Step 2: Add half of a banana. 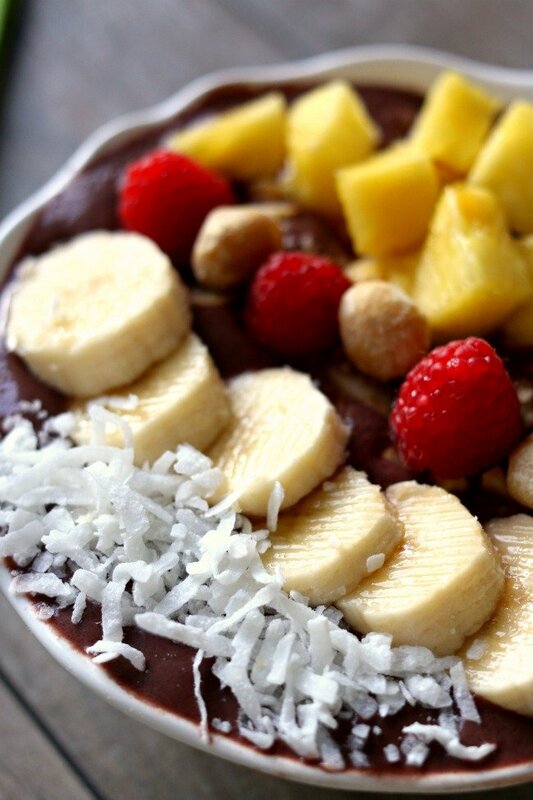 If you want your smoothie bowl to be more like ice cream, then use a frozen banana. Step 3: Run your frozen pack of acai berries under water for 5 seconds. Break it up with your hands. Then, open the plastic and pour the contents into your blender. Step 4: Blend until smooth. Pour into a bowl. Step 5: Top with the macadamia nuts, pineapple, shredded coconut, sliced banana, and raspberries—or the toppings of your choice. Some additional ideas are muesli, blueberries, honey, dark chocolate chips, chia seeds, or almond butter. You can get really creative here!